Handcuffs are heavy duty, and they need a case that won't wear out. Our Double Handcuff Molle pouch is the perfect companion for your handcuffs, built with reinforced rugged material at the bottom to prevent your cuffs from wearing through the case. 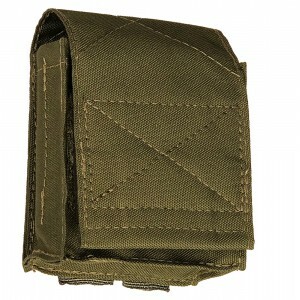 This molle pouch works very well on BlueStone Safety Custom External Vest Carriers/ Load Bearing Vests. If you snap only the bottom snap, this will also fit around most standard sized belts so you can have your handcuffs at your hip. PROUDLY MADE IN THE USA and built to last! Available in Green or Black and backed by our 1 year warranty for craftsmanship.